This product is designed to control two Air Conditioners(A.C. or A/C) simultaneously. The industry standard AVR Micro-Controller is the heart of this system. Control over the A/Cs are performed according to some parameters like temperature, phase voltage, phase current, swapping time etc. User can set or view various parameters like current temperature, phase current, phase voltage, temperature set-point, high room temperature, swapping time, A/C trip current, A.C. last trip reason etc. through a 16 x 2 character LCD panel and a status indication panel will help user quickly monitor the status of the A/Cs. An alarm system generates respective alarm for FMC if any error occurs in the operation. This system keeps the information of last AC trip reason and the overload current at which the Air Conditioner (A.C.) was last tripped in a nonvolatile memory for up to 100 years or the next trip occurs. This devise is fully compatible with VOLTAS SENSICOOL Air Conditioners (A/Cs) used in the shelter of a mobile tower. 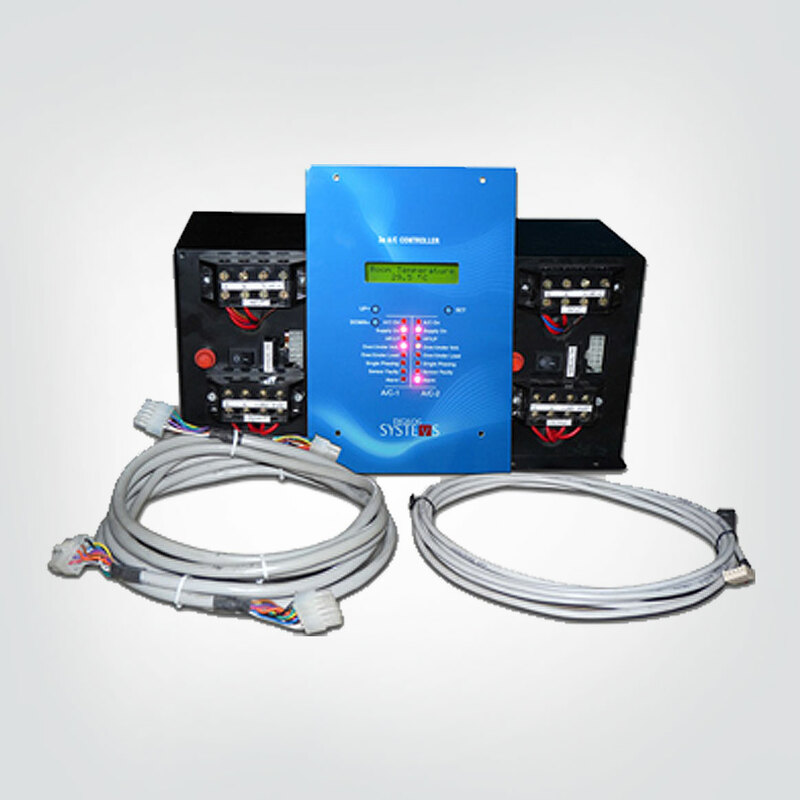 Two controllers can work at a time as per the requirement. One CPU unit is there which will provide the command to each controller. Both controllers will work alternatively after predefined time period (Adjustable from CPU Default – 4hr.). Temperature set point is adjustable from CPU (Adjustable from CPU Default- 27 deg). Second compressor will get start if the shelter temperature goes above high room temperature (Adjustable from CPU Default 30 deg. cent.) and stop when the shelter temperature gets down to Temp. set point(i.e. 27 deg. Cent.). Both A/C will be turned off if the temperature decreases 2 deg. cent. below tem. set point. Blower fan and condenser fan will get start at a time before 30 seconds start of compressor and get stop at the time of compressor get stop. Controller will work with a voltage range i.e. 170 to 260. CPU unit has two column of leds (both unit 1 & 2) for the following parameters. High reliability, three phase two A.C. Controller with HP/LP and alarm system. Fully compatible with VOLTAS SENSICOOL A/Cs used in the shelter of a mobile tower. Nonvolatile memory for last A.C. trip reason. Nonvolatile memory for last A.C. trip overload current.